Dr. Sharad P. Paul practices and teaches internationally in the field of cutaneous oncology and is involved in developing innovative skin products and cosmetics. 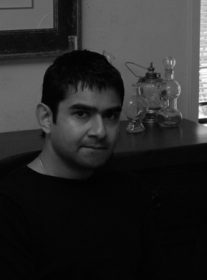 In 2003, he received a Health Innovation Award. In 2008, he was featured in international editions of Time magazine in an article titled “Open Heart Surgeon,” and was called “Renaissance Man” by New Zealand Herald’s em>Canvas magazine and “polymath” by Good magazine. Paul writes literary fiction and runs literacy programs for disadvantaged children via his Baci Foundation charitable trust. In 2012, he was awarded the New Zealand Medical Association’s highest honor, the Chair’s Award, and was a finalist for the New Zealander of the Year Award. His first novel, Cool Cut (Picador, 2007) was reissued in an extended version by HarperCollins as The Kite Flyers in 2013. Paul’s second novel, To Kill a Snow Dragonfly, was published by Fourth Estate in 2012. Skin: A Biography (Fourth Estate, 2013), his first creative non-fiction work, was an ambitious mapping of the history and science of skin and skin color. Dermocracy: By Brown Skin, For Brown Skin (Collins, 2014) his latest, is a definitive guide to Asian skincare. 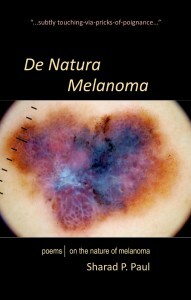 De Natura Melanoma (Middle Island Press, 2014) features poems about melanoma, the often lethal skin cancer that makes up a major part of Paul’s medical work. by Sharad P. Paul, M.D. De Natura Melanoma (on the nature of melanoma) is a collection of poetry by internationally respected cutaneous oncologist and skin cancer surgeon, Dr. Sharad P. Paul. It ends up a short, sumptuous and beautifully written chapbook of a medical doctor and established writer’s literary foray into the world of melanoma, the tumour of melanocytes – which are the cells that make up skin colour. It ends up a memoir about life, narrative medicine and battling cancer. Death. Death. Death. Life. Life. Life. Love. Love. Love. Kindness. No strife.